#1. This week's number one is an international guard Edmir Lucas (191-93, currently plays in United Kingdom). He was the major contributor in a London CR's victory against the eighth-ranked Manchester Giants (1-2) 92-86 in the British BBL in Sunday night's game. Lucas scored 15 points and added 5 passes in 26 minutes on the court. London City Royals (3-1) is placed second in the BBL. It was his team's third consecutive victory in a row. But this is still an early stage of the season and everything may happen. It's Lucas' first year with the team. This season he averages: 9.8ppg, 3.0rpg, 4.0apg, 1.3spg, 2FGP: 30.8% and FT: 57.1% in four games he played so far. Lucas has a dual citizenship: Portuguese and Angolan. Former Desportivo 1. De Agosto Luanda starter played for the Angolan senior national team one years ago. #2. Second place goes to an international center Yanick Moreira (211-91, college: SMU, currently plays in Greece). 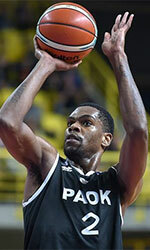 He led PAOK to an easy victory against the ninth-ranked Cretan Kings (0-1) 81-64 in the Greek A1 last Saturday. Moreira recorded a double-double by scoring 16 points and getting 14 rebounds. It was his first game for PAOK this season. His team is placed fifth in the A1. But the season just started, so everything may happen. Moreira is in the roster of the Angolan senior national team. #3. The Angolan player who performed third best last week abroad was an experienced international guard Carlos Morais (200-85, agency: Duran International, currently plays in Italy). He led Mens Sana 1871 to a 1-point victory against the ninth-ranked Bertram TRT (0-1) 78-77 in the Italian Serie A2 (second division) on Saturday night. Morais recorded 19 points and grabbed 5 rebounds in 27 minutes. It was his first game for Mens Sana 1871 this season. His team is placed third in West group. But the season is still in it's first stage and everything can happen. Morais is another player who holds two passports: Angolan and Portuguese. He is also a member of the Angolan senior national team. #4. Forward Antonio Monteiro (204-89, currently plays in Portugal) contributed to an easy victory against the tenth-ranked Imortal (0-1) crushing them 94-65 in the Portuguese LPB in Saturday night's game. 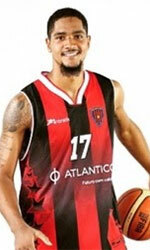 Monteiro recorded 8 points, 6 rebounds and 3 assists. It was his first game for FC Porto this season. His team is placed third in the LPB. The Regular Season already ended. Monteiro has both Angolan and Portuguese nationalities. Despite he played previously for the Portuguese U20 national team, Monteiro is currently in the Angolan national team roster. #5. International guard Jaques Conceicao (190-89, currently plays in Portugal) managed to help Sport Lisboa Benfica in a victory against the league outsider Terceira (0-1) 82-65 in the Portuguese LPB last Saturday. He recorded 5 points in 12 minutes. It was his first game for Benfica this season. His team is placed first in the LPB. The Regular Season already ended. Conceicao plays currently for the Angolan national team. #1. Fernando Mussongo (198-F-96, currently plays in Switzerland) managed to help Lugano Tigers to win against the sixth-ranked Geneve Lions (1-1) 85-84 in the Swiss SBL on Saturday night. He scored only one point. Lugano Tigers (2-0) are placed second in the SBL. But there are still lots of games to play and it's a long way to go. It's Mussongo's first season with the team. Mussongo's overall stats this year are: 2.5ppg, 6.5rpg and 1.5apg. He has a dual citizenship: Angolan and Swiss. #2. Paulo Sopita (203-PF-93, currently plays in Japan). Sopita could not help Iwate Big Bulls (2-1) to beat Saitama Broncos (1-2). He cannot count it as his best performance. Sopita scored only 2 points in 4 minutes on the court. Iwate Big Bulls lost 92-100 on the road to the lower-ranked (#4) Saitama Broncos. It's Sopita's first season with the team. This year his overall stats are: 0.7ppg and 2.0rpg in three games he played so far. #3. Fabio Galiano (202-PF-97, currently plays in Germany) contributed to a 1-point Itzehoe's victory against the 11th-ranked Muenster (1-2) 77-76 in the German ProB (third division) last Saturday. Galiano scored 9 points. Itzehoe Eagles (2-1) is placed second in North group. Galiano's overall stats this season are: 6.3ppg and 2.7rpg. #4. Silvio Mateus (185-G-94, currently plays in Germany) was not able to help Koeln Rh.Stars in their game against Wuerzburg (1-1) in the German ProB (third division). He scored 9 points in 39 minutes. But the tenth-placed Koeln Rh.Stars (0-3) lost 87-93 on the opponent's court to the higher-ranked (#4) Wuerzburg in the South group. So far Koeln Rh.Stars lost all three games in the Regular Season. Mateus has relatively good stats this year: 13.3ppg, 2.3rpg and 3.0apg in three games. He is another player who holds two passports: Angolan and French.